What do you guys think of this look? Would you rock it? Leave a comment! Oh I love Need Supply Co! My man goes to school in RVA so we go pretty often, some of my favorite pieces are from there (on super sale of course). Honestly, I still like the Jeffery Campbell ones more. But not for $110! i think they are equally hideous. I have to agree with heidi...Yikes! I would not rock that look, but good find! I don't really love the shoe. But I do continue to love your blog. I am inspired to try new things, and appreciate the heads up for bargains. Keep it up! This is what I love about fashion -- one woman's favorite find is another woman's least favorite trend. I won't be rocking the oxford (esp. in floral), but I can appreciate the look. I really like the oxford trend--I think it adds an old-time polish to an outfit. Eh, I have to say, I don't really love these. But, I'm not completely won over on oxfords in general. Nice job, seeking out a good bargain option! I don't think I would wear either pair, but someone out there might. And I love a look for less regardless of whether I would wear it or not. 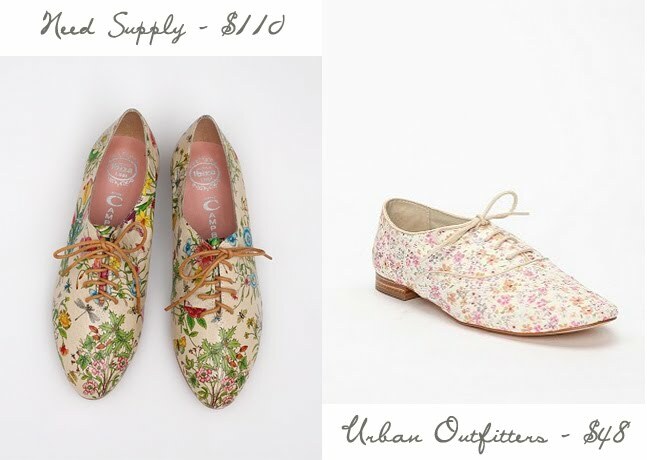 I saw a friend wearing the urban outfitter ones, and they looked rather cute. I'm not sure if I could pull them off though.